Climate change has been the catalyst for an alarming number of extreme weather events in recent months, including the California droughts, as well as Australia’s hottest year on record. The latest of these severe conditions involves an inordinate amount of ice still covering the Great Lakes at a very late point in the year. As of April 16, more than 37 percent of the lakes were still frozen over, which experts are calling an unprecedented amount. In fact, in the last three decades, the next closest winter in terms of Great Lakes ice coverage so late in the year was 1995/96, which reported only 18 percent of the lakes frozen over during the same week in April, or less than half the current total. To add to that staggering fact, just over a month ago, in the middle of March, the NOAA’s Great Lakes Environmental Research Laboratory calculated that 92.2 percent of the lakes were frozen over—the second highest total since record-keeping began in 1973. The ice in Marquette Harbor is said to be two feet thick. These conditions are causing serious economic and environmental setbacks. The U.S. Coast Guard was recently called in to clear a path allowing coal to be delivered from Minnesota to Michigan, so that the mining industry could continue business. On the environmental side of things, a large number of ducks are dying as a result of the harsh conditions, and the entire aquatic ecosystem has been thrown off due to the delayed spawning of fish until the ice thaws. Experts have pointed out that the severe conditions could result in lasting effects on the surrounding environment that may even carry over into subsequent years due to factors like water level and summer weather. 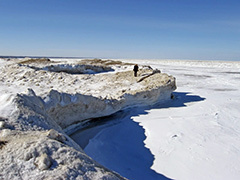 The long-term ramifications of the still-frozen lakes remains to be seen.